The supermodel was Chloe Gosselin's date for last night's event at the Brooklyn Museum. Here, they share a glimpse of how they got ready for American fashion's biggest night. Photos by Alexandra Genova. The CFDA Awards are often described as fashion's answer to the Oscars. It certainly holds its own in the glamour stakes — and last night's event was no exception, honoring Raf Simons, Naomi Campbell, Kim Kardashian and Diane von Furstenberg. But before the good and the great of US fashion descended on the Brooklyn Museum, there was the not-so-small matter of getting ready. CFDA tradition demands that each designer brings a model or muse as their date, and for the 2018 awards, Chloe invited supermodel Hannah Ferguson, whose career so far has seen her cover the Sports Illustrated Swimsuit Edition and a Chanel fragrance campaign. The pair shared a glimpse of the process behind their hair, makeup and eveningwear looks as they prepared for the event among the antique marionette forms and vintage arcade machines that decorate the Manhattan penthouse apartment that Chloe shares with husband David Copperfield and their daughter, Sky. Both Chloe and Hannah supported CFDA designers in their fashion choices. Their dresses were by Gabriela Hearst — who was among the nominees for Womenswear Designer of the Year last night — and their jewelry was by CFDA member Monica Sordo, who is known for her Art Deco-inspired creations. 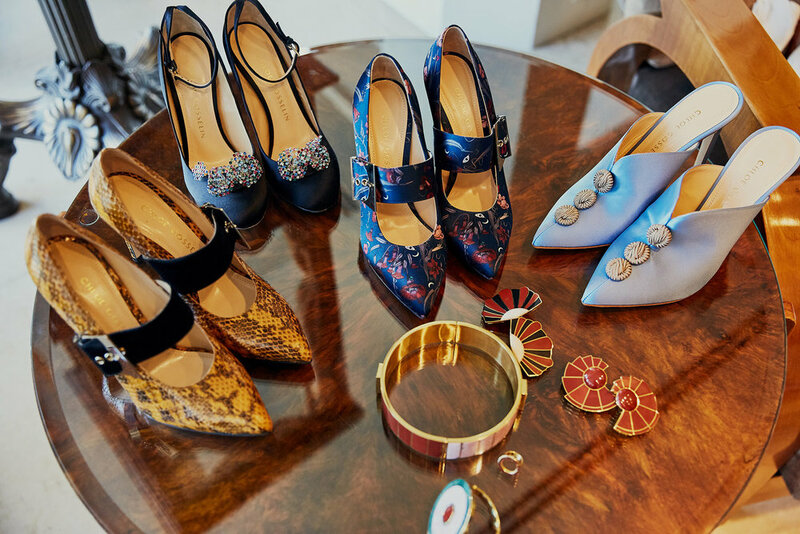 When it came to footwear, they were spoiled for choice, with an array of options from Chloe Gosselin’s fall/winter collection. Makeup artist Laura Stiassni was charged with creating the beauty looks. For Hannah, all the focus was on the lips, which were painted a deep matte red. The rest of her makeup was intentionally minimal: fresh, flawless skin, with a flick of inky eyeliner on the eyes. Hannah's hair, by Dallin James, was pulled back into a low ponytail with a side-parting, again, setting off those lips. The look was completed by a tailored black dress that, like many of Hearst's designs, referenced men's suiting. Chloe's look took a creative lead from old Hollywood glamour. Dallin styled her hair in cascading waves, swept to one side, that echoed the cut of her emerald silk jersey dress from Hearst's fall/winter collection. The verdant hue was complemented by coral lips and immaculately sculpted cheekbones. The finishing touches were the shoes, of course. 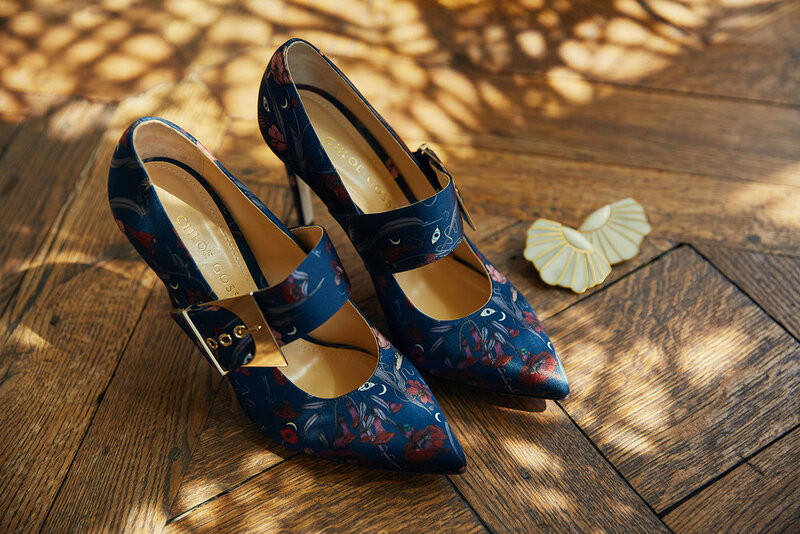 Hannah wore the Cate pumps, a design named after Cate Blanchett, in a new custom print for fall/winter 2018. You can see Chloe's signature moon motif in the buckle. Chloe wore her Tori heels, a sandal named after Tori Amos, in mustard elaphe with oversized vintage buttons, a detail that runs through next season's collection. Before they slipped their phones into their Gabriela Hearst bags — Chloe carried the Patsy bag in forest green crocodile, Hannah carried the Demi in black calf — there was just enough time for photos. Dressed head-to-toe in New York brands, with a 57th floor-view of Manhattan behind them, it was a scene that celebrated the best of the city's design talent — and the perfect mood in which to begin American fashion's most important night.